Continuous Infusion of Angiotensin II Modulates Hypertrophic Differentiation and Apoptosis of Chondrocytes in Cartilage Formation of a Fracture Model Mouse. Yoshikawa Y, Ohmaki E, Kawahata H, Maekawa Y, Ogihara T, Morishita R, Aoki M.: Beneficial effect of laughter therapy on physiological and psychological function in elders. Nursing Open. 2018;1–7. doi: 10.1002/nop2.190. 外林大輔，川畑浩久: 関節拘縮の病態進展メカニズムと低出力超音波パルス（Low Intensity Pulsed Ultrasound）の影響. 日本柔道整復接骨医学会誌. Vol.27, No.3：125-132. 2019. 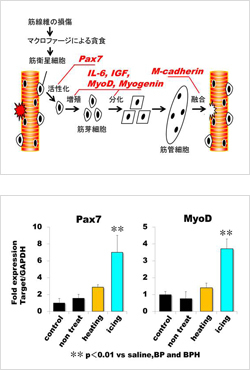 Kawanami H, Kawahata H, Miyuki Mori H, Aoki M. Moxibustion Promotes Formation of Granulation in Wound Healing Process through Induction of TGF-β. Chinese Journal of Integrative Medicine. 2018. In press. 横山浩之: 山崎佐「Illegal Practice of Medicine -医業類似行為-」の紹介. 鍼灸Osaka,34-1,122-128,2018年7月. 福井悠紀子, 川畑浩久, 荻原俊男, 青木元邦: アンジオテンシンIIは変形性関節症における関節軟骨変性を増悪させる. 第18回日本抗加齢医学会総会（大阪）, 2018年5月. 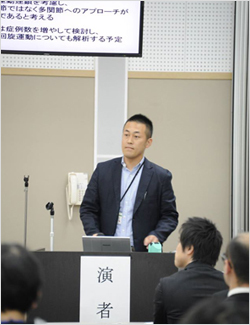 Kawahata H, Aoki M, Ogihara T.: Effect of angiotensin II on metabolism of chondrocytes and degeneration of articular cartilage in osteoarthritis. Premium Hypertension Conference 2018（Tokyo）, 2018年7月. 福井悠紀子, 外林大輔, 森美侑紀, 北野吉廣, 川畑浩久, 青木元邦: レニン-アンギオテンシン（RA）系は変形性関節症における関節軟骨変性を増悪させる. 第60回全国柔道整復学校協会　教員研修会（大阪）, 2018年8月. 外林大輔, 川畑浩久. : 骨格筋の再生過程に温度刺激が与える影響. 第27回日本柔道整復接骨医学会学術大会（名古屋）, 基礎医学研究分科会フォーラム, 2018年10月. 成田真和, 中島茂, 菊谷敏士, 西田智香子, 涌田裕美子, 尾﨑朋文: 腰背部痛に対する鍼灸治療の１症例～バイオリニストが訴えた症例～. 第67回全日本鍼灸学会学術大会（大阪）, 2018年6月. 中島茂, 成田真和, 菊谷敏士, 西田智香子, 涌田裕美子, 尾﨑朋文: 難治性慢性前立腺炎に対する鍼灸治療の１症例. 第67回全日本鍼灸学会学術大会（大阪）, 2018年6月. 中島茂: 経過良好であった末梢性顔面神経麻痺の１症 ―現代医学的アプローチの症例―. 日本臨床鍼灸懇話会定例会（大阪）, 症例報告., 2018年10月. 菊谷敏士, 中島茂, 成田真和, 西田智香子, 涌田裕美子, 尾﨑朋文: 小児のアトピー性皮膚炎に鍼灸治療が有効であった１症例～弁証に基づく小児はり法～. 第67回全日本鍼灸学会学術大会（大阪）, 2018年6月. 川波博, 湯谷達, 南方克之, 向井陽子, 房前素徳, 尾﨑朋文: 灸刺激が局所炎症反応に与える影響. 第67回全日本鍼灸学会学術大会（大阪）, 2018年6月. 湯谷達, 大森菜桜子, 尾﨑朋文, 米山榮: 解離性上肢運動麻痺の一症例～頚椎症の鍼灸適応・不適応判断について～. 第67回全日本鍼灸学会学術大会（大阪）, 2018年6月. 尾﨑朋文, 涌田裕美子, 辻丸泰永, 大月隆史, 松下美穂, 由良拓巳, 門野章, 森谷正之,北村清一郎, 吉田篤: 長胸神経の走行についての肉眼解剖学的検討. 第67回全日本鍼灸学会学術大会（大阪）, 2018年6月. 外林大輔, 伊黒浩二, 川畑浩久：ラット靭帯修復過程に低出力超音波パルス（Low Intensity Pulsed Ultrasound）が与える影響. 日本柔道整復接骨医学会誌. 第25巻3号. 104-110. 2017. Urushima H, Fujimoto M, Mishima T, Ohkawara T, Honda H, Lee H, Kawahata H, Serada S, Naka T.：Leucine-rich alpha 2 glycoprotein promotes Th17 differentiation and collagen-induced arthritis in mice through enhancement of TGF-β-Smad2 signaling in naïve helper T cells. Arthritis Res Ther. 19(1):137. doi: 10.1186/s13075-017-1349-2. 2017. Ohtsuki T, Nabeta T, Nakanishi H, Kawahata H, Morishita R, Aoki M. Electric Field Exposure Improves Subjective Symptoms Related to Sleeplessness in College Students:：A Pilot Study of Electric Field Therapy for Sleep Disorder. Immunology, Endocrine & Metabolic Agents in Medicinal Chemistry. In press. Hiroko-Miyuki Mori, Hideo Iwahashi: Characterization of radicals arising from oxidation of commercially-important essential oils. Free Radic Res. 2016 Jun;50(6):638-644. 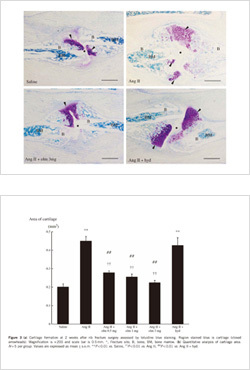 Mori HM, Kawanami H, Kawahata H, Aoki M. Wound healing potential of lavender oil by acceleration of granulation and wound contraction through induction of TGF-β in a rat model. BMC Complement Altern Med. 2016 May 26;16(1):144. doi: 10.1186/s12906-016-1128-7. Sotobayashi D, Kawahata H, Anada N, Ogihara T, Morishita R, Aoki M. Therapeutic Effect of Intra-Articular Injection of Ribbon-Type Decoy Oligonucleotides for Hypoxia Inducible Factor-1 on Joint Contracture in an Immobilized Knee Animal Model. J Gene Med. 2016. 18(8):180-192. 外林大輔, 伊黒浩二, 川畑浩久. ラット靭帯修復過程に低出力超音波パルス（Low Intensity Pulsed Ultrasound）が与える影響. 日本柔道整復接骨医学会誌. 2016. In press. 井上護. 「手で診る」治療家へのステップ. 鍼灸OSAKA. Vol.32: 73-76. 2016. 入江浩正, 小笠原孝嗣, 笹田岩生, 金光寛和, 奥野勝彦, 山本達也, 葉山直史, 吉川徹, 清水尚道. 柔道整復師養成施設における柔道実技の教育効果について. 第58回全国柔道整復学校協会　教員研修会（大阪）. 2016年8月. 森美侑紀, 川畑浩久, 手技療法に植物精油を付加することによる抗炎症作用増強効果の基礎的検証. 第58回全国柔道整復学校協会　教員研修会（大阪）. 2016年8月. 森美侑紀, 川波博, 川畑浩久, 青木元邦. 関節炎モデルラットに対する植物精油の軟骨保護作用. 第5回エビデンスに基づく統合医療(eBIM)研究会（大阪）. 2016年8月. 伊黒浩二, 大森淳次, 馬場裕介, 村上碩煕. スクレロトームとマイオトームを反映したTENS電極設置部位の検討～内側型変形性膝関節症に対する症例報告～. 第25回日本柔道整復接骨医学会（仙台）. 2016年11月. 大森淳次, 村上碩煕, 馬場裕介, 伊黒浩二. MP関節掌側シーネ固定時における皮膚上の屈曲角と骨の角度の差. 第25回日本柔道整復接骨医学会（仙台）. 2016年11月. 村上碩煕, 大森淳次, 馬場裕介, 伊黒浩二. 上腕骨骨幹部短斜骨折で長期を要した一症例. 第25回日本柔道整復接骨医学会（仙台）. 2016年11月. 森美侑紀: 膝関節炎モデルラットに対するEucalylemon精油の有効性の検討．日本アロマセラピー学会誌 14(1): 24 -28，2015. Kawahata H, Sotobayashi D, Aoki M, Shimizu H, Nakagami H, Ogihara T, Morishita R. Continuous Infusion of Angiotensin II Modulates Hypertrophic Differentiation and Apoptosis of Chondrocytes in Cartilage Formation in a Fracture Model Mouse．Hypertension Research，38(6)：382-93，2015. Hiroko-Miyuki Mori, Hideo Iwahashi: Characterization of radicals arising from oxidation of commercially-important essential oils. Free Radical Research, 10.3109/10715762.2016.1162299. in press. 2016. 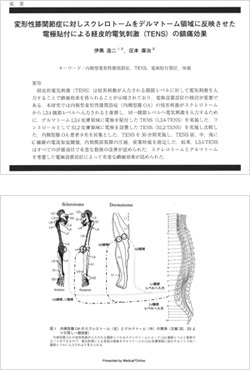 Aoki M, Kawahata H, Sotobayashi D, Yu H, Moriguchi A, Nakagami H, Ogihara T, Morishita R. Effect of angiotensin II receptor blocker, olmesartan, on turnover of bone metabolism in bedridden elderly hypertensive women with disuse syndrome. Geriatr Gerontol Int，2014. in press. Kawahata H, Sotobayashi D, Aoki M, Shimizu H, Nakagami H, Ogihara T, Morishita R. Continuous Infusion of Angiotensin II Modulates Hypertrophic Differentiation and Apoptosis of Chondrocytes in Cartilage Formation in a Fracture Model Mouse. Hypertension Research. 2014. in press. 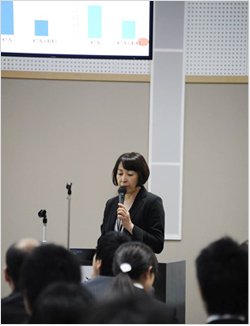 Hiroko-Miyuki Mori, Hideo Iwahashi: Detection and identification of 1-methylethyl and methyl radicals generated by irradiating tea tree (Melaleuca alternifolia) oil with visible light (436 nm) in the presence of flavin mononucleotide and ferrous ion. Free Radical Research, Early Online: 1–7. 2013. Yutani Toru, Kawahata Hirohisa, Sotobayashi Daisuke, Kawanami Hiroshi, Aoki Motokuni: Anti-inflammatory Effect of Electro-acupuncture via Reduction in Colonic Peristalsis in a Mouse Model of Inflammatory Bowel Disease. Immun, Endoc & Metab Agents in Med.Chem 13,122-131.2013. 伊黒浩二, 庄本康治: 変形性膝関節症に対しスクレロトームをデルマトーム領域に反映させた電極貼付による経皮的電気刺激(TENS)の鎮痛効果. 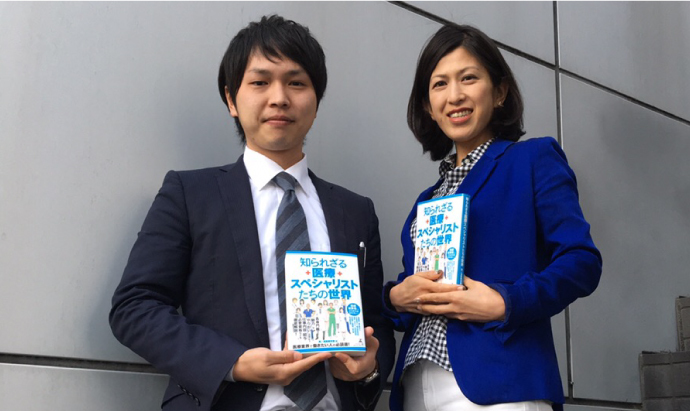 日本物理療法学会会誌20, 35-42, 2013. 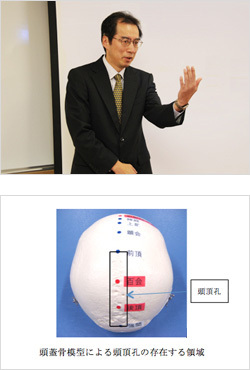 Copyright © 2013-2019 森ノ宮医療学園専門学校 All Right Reserved.